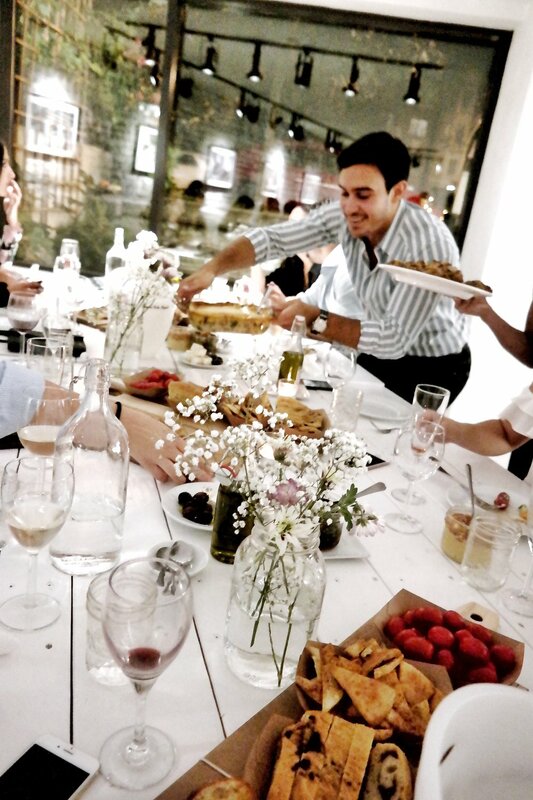 Last month I celebrated my twenty sixth birthday with a big Greek dinner party packed with all of my favourite things, people and food. If you don't know this about me, I love to host dinner parties for any occasion. I'm a big fan of holidays because they give me the chance to share recipes and food I love, entertain and spoil those I care for and bring everyone together for memories and laughter. The best health remedy! On my birthday I had the chance to do just that with some incredible help and healthy eats from Mouton Vert catering and Gallery MV (my mom's photo art gallery and event management company). I wanted all my closest friends together to celebrate. I wanted it to embody me, healthy food, great music (mix of greek and hip hop of course! ), lots of laughs and plenty of wine to go around. This may have been the best birthday yet, and I always say the way you start your year sets the tone for whats to come. Its all in the energy your welcome into your life. I was lucky to be surrounded by all of those things I love and then some. We danced all night, drank and ate, and even broke a plate or two... A La Greek! I always think right before an event why am I doing all this and throwing together a huge party / sit down dinner for 30 of my best friends. Then I remember... because they turn into the best memories with the absolute best people I could have ever wished to be surrounded by. It meant the world to me to look around and see all those people I love in one room. Everything was perfect from every pile of shattered plates down to the last ouzo shot. For ideas on how to style your own greek dinner party visit my pinterest board: Greek Dinner Party. Wearing Atelier Prive, Food / Catering Mouton Vert, Location Gallery MV / Mouton Vert. If you haven't had a chance yet to check out Mouton Vert and their delicious food, they make a wide range of fresh vegan and vegetarian greek dishes. They have a selection of items flown straight in from Greece like Olive Oils and seasonal items like my fave, figs. You can eat there or grab take out. They are open 7 Days a week!